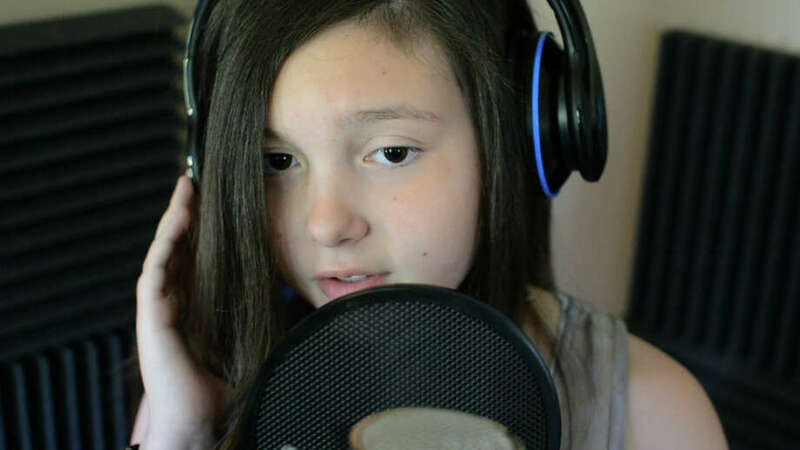 Taylor Felt, 11, performs Believe for her music video. A group of young Connecticut artists are getting together to benefit Newtown in one of the only ways they know how -- through music. On Saturday, Jan. 5, the Fairfield Theatre Company will host eight groups from around Fairfield County, including Taylor Felt from Darien, in a memorial concert to benefit the Connecticut Parent Teacher Student Association Sandy Hook Fund, which is dedicated to providing ongoing assistance to the Newtown community. Two shows are scheduled -- one at 7 p.m. and one at 9:30 p.m. Tickets are $10 and all proceeds benefit the fund. The inspiration for the event came from Cameron Luther after his older brother, Niles, and his friends were wondering how they could help those affected in Newtown as musicians. "Music is something that runs through all of us," Niles Luther, a cellist from Fairfield, said. "I believe it can unite and inspire us, and I feel like the use of music and the use of a concert will help those affected to feel closer to each other." The high school junior said he hopes Newtown will be inspired by all of the performing artists, all of whom are either students or recent graduates. When Luther's mother found Felt on YouTube, they both agreed Felt would be a great addition to the program. "We thought it would be really nice to incorporate people of all ages," Luther said. The 11-year-old started singing when she was 2, and over the years she's taken on dancing and acting. She's been featured in the Trumbull Arts Festival for two years in a row and has participated in Darien's Young Composers, which features all original work and artists of all ages, for the past three years. Felt said when she heard about the tragedy and immediately wanted to help. She just wasn't sure how. "And then I heard I could sing and I thought `This is amazing,'" she said. "I just really want to inspire people and make them happy. In that moment when I'm playing my song I want them to get at least a glimpse of happiness." Her mother Christine said most of Felt's songs, are inspiring. "She's a really go-for-it girl," Christine Felt said. "She wants people to be proud of who they are." She will perform "Believe," which she considers her best of the nine or 10 songs she's written, at the concert. "It just shows you always keep going and don't stop and always believe in yourself and just be yourself," Felt said. At the end of the concert there will be a chorus singing "You Raise Me Up." "It's such a good cause, that's the most important thing," Felt said of the concert. "People just shouldn't sit around and feel better, you should change something and do something to help them if you can." When asked if she ever gets nervous on stage, Felt immediately responded no. "I really get more excited when I go on stage," she said. "I love to entertain people and just make them happy. I just think that's the best feeling." When Christine Felt learned her daughter was invited to the concert, she felt honored. "I thought it was a great opportunity to just share her music with a group of young musicians who can make a difference for an evening," she said. When Felt isn't acting, singing, dancing, writing new songs or playing piano, she said she enjoys baking, drawing and writing. "I think singing is my favorite of all of them because I get to be myself and show off my personality," she said. "I get to have that confidence in myself to show the whole audience that I'm confident." Taylor's ultimate goal is to perform at Madison Square Garden. And somehow, on top of all of her extracurricular activities, she still manages to get straight As. "I always think school comes first; I make that own rule for myself," Felt said. "You have to do well in school to do what you want to do."